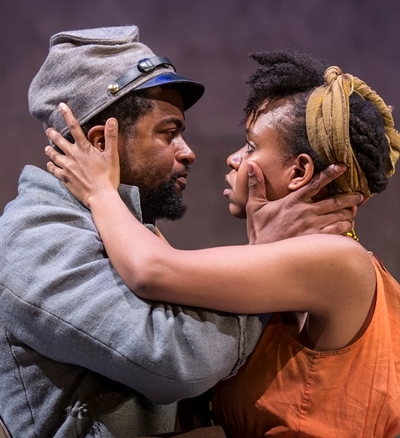 Hero is strong young slave in the 1860s South who finds himself agonizing over an option: Accept his owner’s proposition to accompany him into the war against the Yankees, in exchange for his subsequent freedom, or remain behind as a slave for the rest of his life. 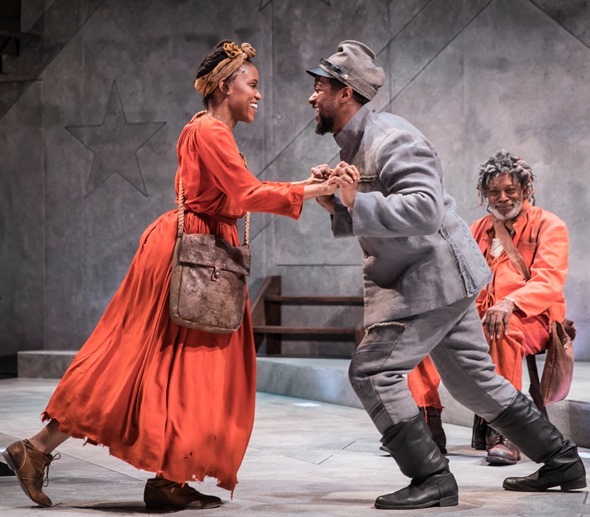 That’s the setup of Suzan-Lori Parks’ epic and very human play “Father Comes Home From the Wars,” now on smart, provocative and impassioned display at Goodman Theatre under the direction of Niegel Smith. Actually, there’s a bit more to the setup. Parks’ narrative, divided into three parts, loosely parallels the ancient Greek legend of “The Odyssey.” Hero even has a friend among his fellow slaves called Homer, and Hero’s dog’s name is Odyssey, though it’s pronounced ODD-see. (I know it’s really Odyssey because the program book says so.) The dog makes a cameo appearance in a small but philosophical speaking role. There is one more notable parallel between “Father Comes Home From the Wars” and “The Odyssey.” Hero has a faithful wife who vows to wait for him, and does – well, after her fashion. Her name is Penny, likely the very moniker of affection the bold and wily Odysseus spoke softly each time he thought of his dear Penelope on his adventure-laden, 10-year journey homeward after the Trojan War. If only for the sake of completeness, I might also mention a small poetic muddle that Parks gets herself into at the end of the play. I can’t exactly spell it out lest I ruin the surprise; let’s just say that the denouement lies closer to the story of another Trojan War returnee, Agamemnon, than to the homecoming of Odysseus. 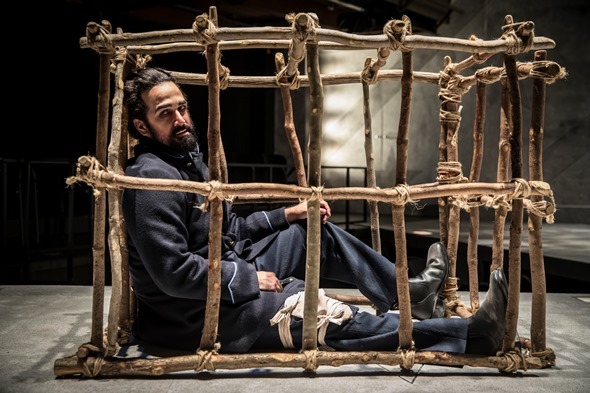 Hero’s arrival with a new name, that of a celebrated Yankee general, does nothing to alter the plain fact that Parks has plucked a string from Agamemnon’s bow. At least Penny does not induce her long-absent, grimy husband to settle into a nice hot bath. She takes a different path. 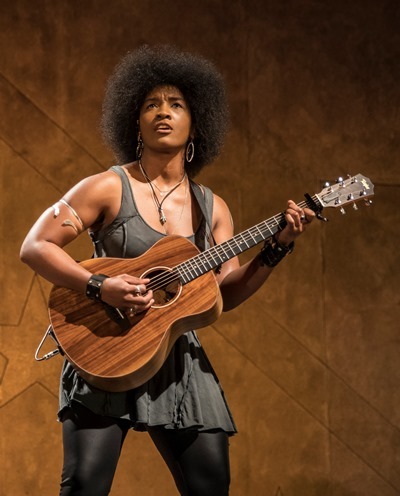 Where a poet-singer like Homer would have accompanied himself on a small harp, Park uses a guitar-strumming vocalist to preface and punctuate the narrative in style and lyrics blending folk and blues. The very fine singer here is Melody Angel, whose every return to the spotlight is another highlight of the experience. Kamal Angelo Bolden cuts an imposing figure as Hero, looked up to by his fellow slaves and devoted to his rather mercurial master. Yet Hero also harbors a dark and awful secret that will come to light with devastating consequences – another Greek twist in this tale of seeming triumph. As the sort of, pretty much, in-her-heart faithful Penny, Aimé Donna Kelly offers an affecting portrait of a woman desperate the keep her man safe at home and who believes in him implicitly. Kelly’s good woman touches the vulnerable side of Bolden’s willful but wavering Hero. They do a convincing dance that seems to lead in one direction until, well, events change Hero’s course. The odd man out in an uneasy triangle with Hero and Penny is Homer, who hobbles about on one foot – the other having been cut off by Hero on the Colonel’s orders after Homer ran away only to be apprehended and thus severely punished. Homer is both Hero’s best friend and Penny’s not-so-secret admirer. Jaime Lincoln Smith’s somber, direct Homer offers an appealing honesty that lends credence to the entire enterprise. 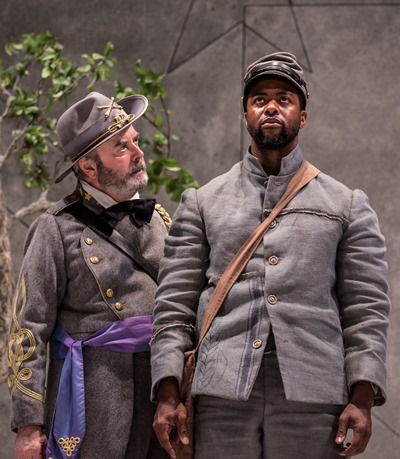 The play’s entire first part is occupied by Hero’s ambivalence about going off to war with the Colonel and the debate (even a wager of precious possessions) among the other slaves – a veritable Greek chorus – over which way he will jump. Among them is Hero’s ancient “father” (caring and wisely indulgent in the person of Ernest Perry, Jr.), not his real father but the only one in that role Hero has ever known. Against his heart’s wishes, the old man urges the younger to go, do this honorable thing. Unless, of course, that’s not what the lad wants! Troy’s helpless officer is one bold fellow, gamely sparring verbally with his captor as Hero answers meekly to the Colonel’s bidding and cannon boom (but whose?) in the distance. It’s a tightly written scene, played to the edge by all three actors. And it brings a doozy of a discovery. 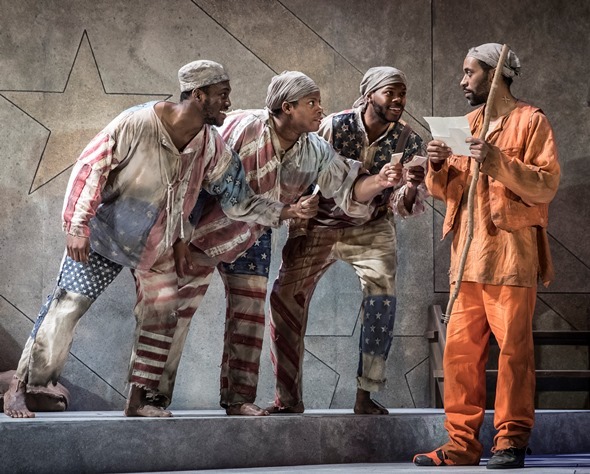 Then homecoming, and some probing exchanges between Hero (now renamed) and a chorus of three slaves swathed in torn pieces of American flags (created by the show’s imaginative costumer, Linda Cho). The long-missing dog Odyssey (the delightful BrittneyLove Smith, and it’s ODD-see!) resurfaces, the soul of empathy, helping the audience with trenchant observations about big-picture stuff. There are revelations all around; there is stark reality. Hero has prevailed. He bears gifts for everyone, and he has a really great surprise. He wants Penny to hear it first. Call it the spoils of war. And the ruin.